INDICATIONS AS AT 12 NOVEMBER 2003 : Minocycline may be used for the treatment of infections caused by any of the following organisms provided that they have been shown by bacteriological testing to be susceptible to minocycline: Escherichia coli, Enterobacter aerogenes, Haemophilus influenzae, Klebsiella and Proteus. It may also be used in the treatment of infections due to Streptococcus pyogenes (group A Beta-haemolytic) and Streptococcus faecalis but because a large proportion of these organisms are resistant to tetracyclines, minocycline should be used only if the orgaisms have been shown to be definitely sensitive. Tetracyclines, including minocycline, are not the drugs of choice in the treatment of staphylococcal infections. Minocycline may be considered for the treatment of such infections only if other suitable agents are not available and the organism has been shown to be sensitive to minocycline. Minocycline may be used in the treatment of tetracycline-resistant acne. 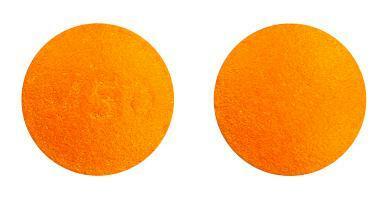 Round, convex, orange film coated tablet, engraved "M50" on one side, the other plain: approximately 6.35mm in diameter.